On public demand (and we here are about as public-ity-hungry as Medha Patkar), more Greatbong Awards for the year 2006 are now announced. If there is anyone in the world who embodies this spirit of self-effacing modesty, it is Himesh Reshammiya, India’s greatest ever singer, rockstar and music composer. It is not every human being who can appeal to denizens of the netherworld, balance the unadulterated adulation of manic fans who type in capitals, clothe the naked through a line of fashionable apparel named after his songs, diffuse his sublime musical talents to the unwashed by setting up a chain of music schools all over the country and still remain as down-to-earth as Himeshbhai. While other celebrities seek to enhance their aura by making themselves inaccessible to the public, Himesh is refreshingly different. He feels that if he does not bare his own love story to his fans (like Paris Hilton), then he will remain “incomplete” (adhoora). That is why he is helming a bio-pic about himself called “Aap Ka Suroor” where, at a supposed cost of 75 crores, he will reveal, among other things why “God’s screenplay” is so unfair. â€œBhagwan ka screenplay bhi aajab hai, kabhi kaisi ko mukambal jaan nahi milta, har insaan ne kabhi na kabhi kisi na kisi se pyaar kiya hai, maine bhi kiya hai, aur agar ab meri love story aap logo ke saath maine share nahi ki to meri zindagi adhoori â€¦..
Then the song tanhaiyaaaa, tanhaiyaaaa starts. Amazing ! 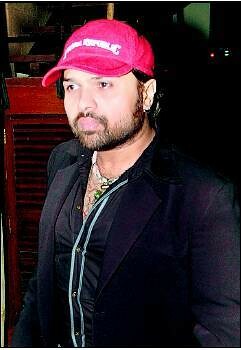 As the fans await with bated breath the release of “Aap Ka Suroor” for startling revelations about his life (the promos that show Himesh jet-setting around Europe with blondes on his arm Bond-style has prompted internet chatter that Mr. Reshammiya may reveal himself to be an agent of “Nassad”, an ulta-secret, nasally-active wing of the Israeli secret service, Mossad), we wish Himeshbhai all the best for 2007 and congratulate him for sharing. And caring. And all the while remaining as modest as possible. Sooraj Barjatiya’s movies have been acknowledged for painting a picture-perfect if though slightly unrealisable ideal of the Indian family: where the patriarch sits on the high-backed chair while the younger siblings gather at his feet, the trusty all-sacrificing servant helps the son with his naughty antics and the son sings, dances and exchanges sweet nothings with the ghar ki bahoo on karwa chauth and everything is fun and games. Let us be re-introduced to the Mahajans. Where the patriarch is shot to death by the younger sibling, the servant dies while snorting drugs with the son and the son thrashes up the ghar ki bahoo, putting a rather interesting twist to the “Hai Ram, kuriyo ko daale dana”. Kiran More is universally acknowledged to be India’s greatest wicketkeeper ever — remember how he called Kirmani a goalkeeper during a selection committee meeting? One thing that he learned from his years behind the wickets was that a good wicketkeeper never grabs at balls, but stands patiently with legs wide apart, keeping his hands cupped and waits for the balls to settle into them. Which kind of summarizes the technique by which he forged an alliance with Greg Chappell. Cemented by an “private” agreement by which Kiran More became an “agent” of Chappell’s coaching school in Australia for “fun (read rich) and professional cricketers” and joined at the hip by a shared vision of filling up the Indian team with suitably pliant “yes” men and regional quota fillers masquerading as talent, they built up the team of the future, a team that is considered by many to be the favourites for next year’s World Cup. Kabaddi World Cup that is. For overweight people like us, one of the main challenges is to realize when we have crossed the line from “a few extra pounds” to “holy cow, look at that fat guy” category. This year it was our Didi who realized that she had crossed that line when pictures of couches and tables that she had sat/lain down upon were shown to the press and the public and it was revealed that the state exchequer needs to spend 15 lacs to bear the brunt of her gravitational attraction. However once Didi realized that she had a problem on her hand (in addition to having becoming politically redundant), she did not give in to procrastination but immediately went on a fasting diet. But then again we all know that even more difficult than starting a diet is to keep it going and this is where Didi showed us the way by affixing a motivatory cause (farmers of Singur) to her dieting plan in the process killing two birds with one stone: weight loss and political ruckus creation. Simply Brilliant! This post and the previous one. nice write up greatbong…the one about Himesh was too good…75 crores for a movie and what are the taxmen doing?? ?a story about his cap and why he is always sad is worth 75 crores….indeed a thing to ponder…. Where would he spent those 75 crs of Rs. There is probably no chance of any hollywood-style blasts, gunshots, crushes.. There’s his cap, overcoat and those gumnam chehera of unknown models. @GB: I read the last post but didnâ€™t have time to comment. The last one and this one â€“ both are fantastic. But I think this post is even better. Where do I start? I think the second about a wholesome Indian family (specially the picture of Rahul slumping on the police, who himself needs some assistance with his extra kilos) and the fourth about Didiâ€™s dieting take the cake. Do you know that Didi now really looks thinner? So all those gym & health spa owners: we donâ€™t need to sweat it out in your gyms, all one has to do is go for a hunger strike and the issue can be anything â€“ one can always find some issue or other in oneâ€™s married life, professional life etc – isnâ€™t it? How on earth you come up with all those superb lines â€“ it is difficult to even write one. Good, that you are not in India otherwise there will be so many camps after you/your head/writing hand â€“ all they have to do is to form a cooperative(for tax exemption) and hire some one for the job!! “Muhammed Ali Award for Humility 2006”: I think Himesh had competition from Anu Malik, who’s also probably his inspiration for megalomania, supported by bad singing! Fantastic! yes didi takes the cake…but cant eat it yet. — ROTFLMAO! Couldnt have described it better. Jeez, that was a priceless line! Its funny that you mention Himesh bong. I actually had a chance to meet him for a television interview. He was very gracious, telling us all about how “god” gave him his ungodly singing talent. Picture Himesh Reshammiya standing on a crossroads, near highway 61. He was gracious enough to make sure that he took up most of the recording time on the tape so that his backup singers had only 5 minutes to speak before we had to cut them off for time reasons. Usable footage of himesh reshammiya: maybe 3 minutes where he spoke something that actually made sense and wasn’t punctuated by, “Ya, you know, i mean”. How on earth do you get hold of all the pictures in your post? Amazing research. Aaah the vision of Chappell’s unmentionables slowly sinking into Kiran More’s palms will haunt me for many nights to come ! As good as first one. GB you rock!!!! Thoughts on Ganguly’s critic-silencing comeback? His fighting fifty in the first innings may well turn out to be what made the difference between the two sides…. apart from Sreesanth’s unbelievable seam bowling of course. I was just wondering — had the Singur crisis had been in some other “developed” states of India, the leader of the opposition would have used the money, which Mamata Banerjee is using for organizing mass protest, to be donated to the displaced farmer (probably organized and publicized fund raising campaigns) to rehabilitate them. This way, they would have won more public sympathy for being compassionate, as well as tarnished the government decision. Isn’t this easier and more effective? Are we (bengalis) take more pride in pointing out mistakes than finding easy solutions? Why no award for Medha? You are also oppressing the poor. @Amit: Indeed he should. And for bowling at Sourav Ganguly wearing a dhoti. @Ram: The taxmen? Listening to Himesh of course. @Joy Forever: Tough to overlook that. @Vivek: Thanks for pointing that out. My bad. @Dix: And a few for the nasal decongestant. @Yourfan: Didi thinner? You mean she is now Mamata Kulkarni-size ? And yes I just love that picture of Rahul Mahajan and the irony is that he will become a politician one day, despite such an amazing picture existing in the public domain. @Just Mohit: HR is waaay ahead. @Varsha: Cannot publicly be seen eating it. @Bonatellis: Sambit Bal still has a long way to go before getting into the Didi-Himesh-Rahul Mahajan category..
@Amit: Had this been in any other state, there just would not have been this ruckus. You mean to tell me that all the development in other states takes place without any displacement? @Confused: She has got one too many from the NGOs already. “Nassad”….priceless! And, “to bear the brunt of her gravitational attraction”..too good! You play with words like a piano. @GB: Sorry, canâ€™t give you the good news relating Didi now being Mamta Kulkarni after Didiâ€™s diet â€“ I mean the fast â€“at least not from the point of reference which made MK the famous MK!! Now Didi looks like a sukno dadi!! @Lotus Eyes: There have been so many commenters including me (for this post and other posts) who have praised GBâ€™s humorous writing style. Your â€˜You play with words like a pianoâ€™ is so apt and I thank you for saying it so nicely. I am speechless…With much effort, all i can manage is… Muchas Gracias! Best wishes for a holiday season. @GB: Yes, I feel that it is lot more easier to make displacements for developments in other states than West Bengal. This is my opinion and I say that with reference to the road-widening and other slum cleansing operation that I see in Maharashtra… and then again I see Mamata Banerjee fighting for the rights of Hawkers. Well, I know you have a direct contradiction in Narmada Bachao Andolan, but atleast the chief opposition leader of a state is not involved in that case unlike WB. Also, I am sorry to post my comment here, since this blog page is on a silly note, which I realized after posting – but I was just speaking my mind. The award nominations were wonderful.